Yarnell Hill Wildfire Perimeter, Hotspot and Location Map 7-1-13 late p.m.
Yarnell Hill Wildfire Perimeter, Hotspot and Location Map 7-1-13 p.m.
LODD's Update: Nineteen firefighters who were battling a fire near Yarnell in Yavapai County were overrun by flames and deployed their shelters. They were later found dead in and around the shelters. Eighteen of the dead in Arizona were from the Prescott Fire Department's elite Granite Mountain Hotshots team. Some resources were pulled from the line this afternoon following the tragedy involving the Granite Mtn Hotshots. Officials lost radio contact with the crew at 4:30 p.m. Sunday, said Steve Skurja, assistant spokesman for the Yavapai County Sheriff’s Office. A helicopter crew spotted the bodies, he told The Times. He said all of the firefighters had deployed their fire shelters -- an emergency measure when there is no escape. “The fire was very aggressive. It just overtook them,” Skurja said. Update 7-1-13 1300hrs: 8,374 acres Fuels Involved: Chaparral and grass Fire Behavior: Uphill runs with 15-20 ft flame lengths, extreme fire behavior with wind and slope alignment. Short and mid-range spotting. Movement is north and east at 1/2 mile/hour. 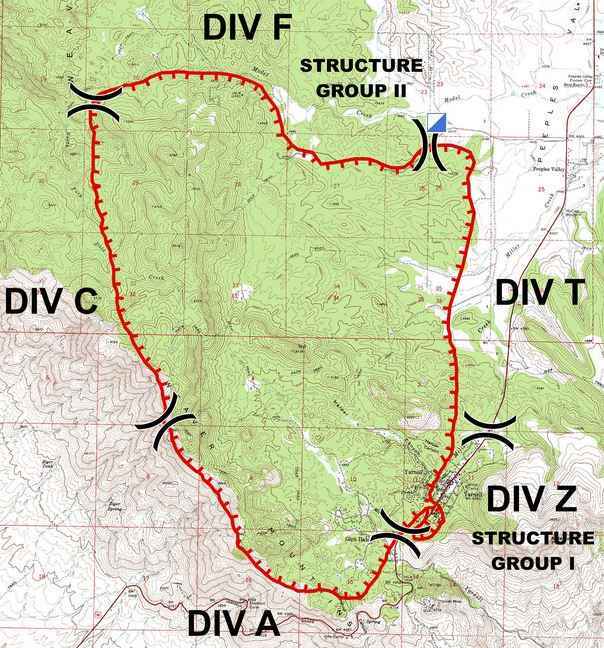 Update 7-1-13 0800hrs: 8000 acres.The wildfire that sparked just southwest of Prescott after an apparent lightning strike grew from four acres to more than 6,000 acres Sunday, forcing the evacuation of several communities. It continued on its path Monday, surpassing 8,000 acres. Reichling said of the 500 structures in Yarnell, including homes, business and sheds, half of them have been destroyed in the fire. No structures in Peeples Valley have been affected as of yet. As of 8 a.m. on Monday there were 18 engines, 18 fire crews, 8 support water tenders, 2 crash/rescue vehicles, 2 structure protection vehicles, and 4 dozers. On order are more 20-person hotshot crews, type 2 hand crews and other firefighting personnel and equipment. A Type 1 Incident Command Team will assume responsibility for the fire at or before 6 p.m. Monday. Reichling said there were four planes working the fire. Fire crews are expected to be on scene for at least a week. Update 2300hrs: Nineteen firefighters who were battling a fire near Yarnell in Yavapai County were overrun by flames and deployed their shelters. They were later found dead in and around the shelters. Eighteen of the dead in Arizona were from the Prescott Fire Department's elite Granite Mountain Hotshots team. One member of the Granite Mountain Hotshots survived, Prescott Fire spokesman Wade Ward said. That crew member was reportedly working in another location and was serving as a lookout for the Granite Mountain team. The crew killed in the massive blaze had worked other wildfires in recent weeks in New Mexico and Arizona. The unit was established in 2002. Update 1800hrs: 1300 acres, 250 homes reported lost, significant wind shift with very gusty wind conditions, low RH and high temps in the last few hours. 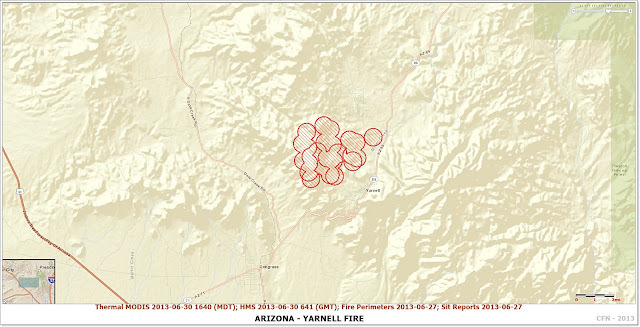 growing fire in Yarnell forced about 600 residents from their homes and is at nearly 1000 acres with zero containment. Evacuations: The towns of Yarnell and Peeples Valley are being evacuated. A reverse 911 call has been sent and the Sheriff's Office is going door-to-door to alert residents. A reverse 911 call has been sent and the Sheriff's Office is going door-to-door to alert residents. Road Closures: heriff's Office has established three road block areas: junction of Hwy 89 and Hayes Ranch Road; Hayes Ranch Road and Sickles Ranch Road; and Buckhorn Road and Frontier Road. The Yarnell Hill fire started on 6/28 and is now 800-1000 acres. Hall's Type 2 team assumed command of the fire at 1000 hrs today. A type 1 incident management team has been ordered. Firefighters are working to secure the eastern flank of the fire and protect any homes at risk from the evacuated areas. Location 1.5 miles west of Yarnell, AZ. Fire Behavior - Uphill runs with 15-20 ft flame lengths, extreme fire behavior with wind and slope alignment. Short and mid-range spotting. Movement is north and east at 1/2 mile/hour. Significant Events The towns of Yarnell and Peeples Valley are being evacuated at this time. 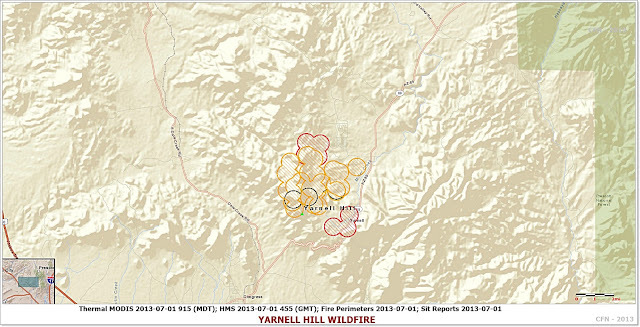 Outlook Planned Actions - Establish structure protection in Yarnell area. Continue direct attack along eastern flank of fire.